HP's EliteBook 8440p is a sturdily built business laptop with enough power to make office productivity tasks a breeze. It's got a functional and attractive design that's sure to turn heads. We're suckers for a nice-looking business notebook, which is the kind of sad confession you'd expect from people who spend their life playing with tech (we only do it for the pay cheque, honest). 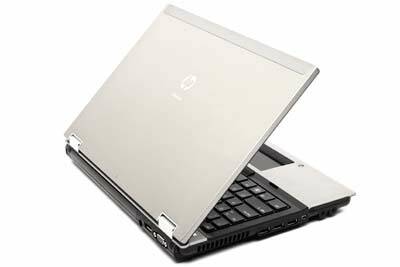 But who could resist the 14in HP EliteBook 8440p (WL653PA)? It's a beautifully built, feature-packed business notebook, and we were very happy to spend some quality one-on-one time with it. It's easy to get caught up in the minutiae of a notebook's technical specifications, but a big part of buying a great laptop that suits you is getting one with the right design. And the HP EliteBook 8440p's is a ripper. It compares favourably with top-end business laptops from Dell and Lenovo. The magnesium alloy chassis feels incredibly sturdy and looks wonderful. The LED-backlit screen is held in place by metal hinges, and the notebook has a latched closing system. Embedded in the bezel are a webcam and a keyboard light. The display has a nice matte finish (great if you're working under fluorescent lights). It doesn't have exceptional viewing angles, but images look crisp and clear. The EliteBook 8440p weighs a little over 2kg, so it's not an ultraportable notebook. But given HP's data sheet notes it's designed "to meet the tough military standards (MIL-STD 810G) for vibration, dust, humidity, altitude, and high temperatures", we're not surprised, and the weight feels reassuring (we also love its balance). The keyboard is exceptional, with full-sized keys that are comfortable to type with. We wish the keys had a smidgen more travel, but this is a quibble. Above the keyboard are touch-sensitive buttons to disable the touchpad and wireless, adjust volume and launch a Web browser. There's also a button that brings up a menu to install HP software (such as HP's 3D DriveGuard to protect your data if you knock the laptop). We couldn't find any way to remap this button to do something useful, which, quite frankly, is bizarre. We loved the location of the fingerprint reader — on the palm rest's far right — because it's out of the way and you aren't likely to hit it with a thumb when using the touchpad. The notebook's beauty is just not chassis-deep: inside there are components that should keep any road warrior happy, as long as they aren't engaging in specialised tasks (like 3D design) or playing high-end games (stick to Solitaire). 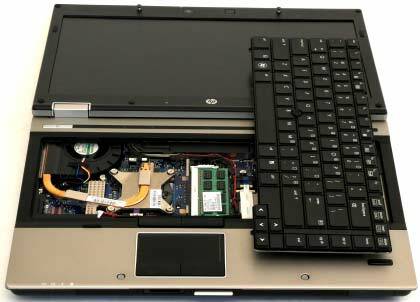 The notebook is equipped with an Intel Core i5-540M CPU that runs at 2.53 GHz and 2GB of DDR3 RAM. The CPU has two physical cores, so you will have four virtual cores to play with in total thanks to Hyper-Threading. Turbo Boost can jack the clockspeed up to 3.066GHz automatically. Quite frankly, most office productivity tasks won't require this — the multiple cores are much more important, because they ensure that multitasking will be a breeze. 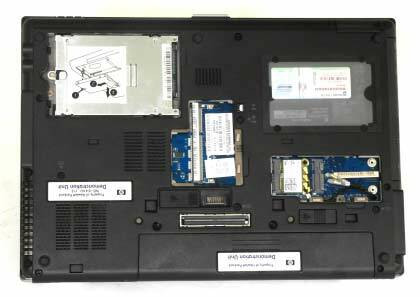 The HP EliteBook 8440p (WL653PA) has two RAM slots: one is accessible via an easily removable panel on the base, while the other (below) requires you to remove the keyboard. When we ran our WorldBench 6 test suite, the notebook scored an excellent 107. The MP3 encoding and Blender 3D rendering tests took 58 seconds and 54 seconds respectively to complete, which isn't particularly impressive — these results are slightly slower than the budget Medion Akoya MD98330, a Core i3 notebook for home users. 3DMark06 returned a low score of 1770; this is an unsurprising result from the integrated Intel graphics adapter (though it still falls short of many non-business notebooks that have integrated graphics). Modern games are pretty much ruled out — hardly a surprise for a notebook that means Srs Bsns — but you'll be able to watch high-definition videos. We tested the battery by disabling power saving, turning up the screen brightness and enabling Wi-Fi, then looping an SD video file. The notebook lasted 2hr 26min. It's a not a bad result for a laptop this size packing decent components under the hood. HP's 15in Probook 6540b only lasted 2hr 13min, while Dell's smaller, 13in Vostro V13 lasted 2hr 1min. Around the sides you get pretty much everything you'd want from a business notebook: four USB 2.0 ports (one doubles as an eSATA port), an ExpressCard/54 slot, FireWire, a dial-up modem, mic and headphone jacks, an SD card slot, Gigabit Ethernet (there's also 802.11n Wi-Fi and Bluetooth), a smart card reader — deep breath — a Kensington lock slot, a DVD burner and a VGA (D-sub) connection and DisplayPort for hooking up an external monitor. We freely admit to being infatuated with this notebook; we heard strains of Barry White playing every time we came near it. But we think you'll probably love it too: it looks stunning while retaining a functional design, and it offers pretty much everything you'd want from a business notebook. Check it out in store and prepare to be smitten. You'll shell out almost $2700, but for a business notebook of this calibre we think that's a pretty reasonable proposition.